2016 went off brilliantly. A wonderful night was had by all. Isobelle Carmody cannot come, but Robert Hoge, author of Ugly will be taking her place. So who else is coming? Here are all our Brisbane guests. Digital illustrator Andy Geppert lives and works in Brisbane, Australia.After 10 years’ experience as an advertising art director, he turned his focus towards creating playful images that capture your imagination and speak to your inner child. Andy’s first picture book, Little Big Tree, was a joint winner of the Children’s Book Council of Australia (CBCA) Crichton Award 2010. She gained a bachelor degree of animation in 2005 and has more than 30 storybooks and some educational books. She has also designed, illustrated and animated some apps, TV games and multimedia education materials as well. She used to work in Top Publishing in Turkey as a full time illustrator. Anil usually illustrates digitally. In 2015 her first book with Scholastic called River Riddle was published and she has a new title coming out with them in April called Supermum. His most recent books have been his Recon Team Angel series about humanity losing a war against alien invaders with a team of teenagers risking everything to overcome the odds and finally a new Rampage at Waterloo, the first of the new Battlesaurus series – an alternative history re-imagines the 1815 Battle of Waterloo as a victory for the French emperor Napoléon Bonaparte, when he unleashes a terrible secret weapon – giant carnivorous survivors from pre-history – on his unsuspecting British and Prussian adversaries. Giuseppe Poli has been drawing from a very young age and is always excited about imagination and adventures. In high school, he teamed up with a great friend and crafted their own role-playing game system, created stories and artworks. After Uni, he worked in the Visual Effects Film Industry and in 2003 a dream came true when he got the opportunity to work on Lord of the Rings : The Return of the King. Whilst at Weta Digital, he seized an opportunity to spend his spare time with the incredible sculptors at Weta Workshop learning what he could from Richard Taylor and his amazing team. He also got to meet the world-renowned artist, Alan Lee and see a master artist’s workplace and numerous sketch books. These marvellous experiences propelled him to pursue his own creative endeavours, and now after a long, long adventure of pondering and creating, he has been fortunate enough to have published two children’s picture books and soon a third, with many more to come. James Moloney is one of Australia’s leading writers for children and young adults. His passion for story telling has seen him produce more than forty books right across the age range from ‘seven to seventeen year-olds.’ Many have won literary awards, but he gets his greatest satisfaction from regular shortlistings in the Children’s Choice awards. His YA novel ‘Silvermay’ won the Gold Inky Award, the foremost readers choice award for teenagers in Australia. James grew up in Brisbane, where he was more interested in playing Rugby than anything to do with books, but during teacher training he succumbed to the lure of literature. Two years teaching indigenous children led to his ground-breaking novels Dougy and Gracey which take an unflinching look at Australian racism and identity. A Bridge to Wiseman’s Cove, a study of loneliness and a young man’s attempts to redeem his family’s past is one of this country’s quiet best-sellers and widely studied in high schools. In recent years he has branched out into fantasy and humour. ‘I always swore I’d never use any of my family as characters,’ he maintains. ‘Then I wrote Black Taxi where the feisty heroine is a dead ringer for my daughter. Just as well she thinks it’s a hoot.’ His fantasy, The Book of Lies, brings him more emails from readers than any other book and prompted two sequels, Master of the Books and The Book from Baden Dark. Jennifer Loakes is a Brisbane-based writer and psychologist (provisionally registered). Mate and Me is her first book, published in July 2015 by Windy Hollow Books. Julie Fison grew up in Brisbane exploring her local creeks and the islands around Moreton Bay, harbouring an ambition to work with animals. Instead she became a television news reporter, working in Australia, Asia and Europe, covering stories of all sizes and significance – shaking hands with heads of state one week and orangutans the next. A family holiday on the Noosa River, in Queensland, inspired her to write a series of adventure stories for young readers, called Hazard River (using the pen-name J.E. Fison – Ford Street Publishing 2010). The stories are fast-paced and fun with an environmental twist. Kerry Brown grew up in Carnarvon, a coastal country town in Western Australia. Her childhood was typical of most children of that time, playing endlessly outside with her friends and spending holidays at the family ‘shack’ near the Blowholes. Her imagination worked overtime as she made new discoveries and invented new games behind the sand dunes with her friends. This imagination may have lay dormant for a few years but never strayed far, and was reignited soon after the birth of her two children, who continue to be her biggest inspiration. Lachlan Creagh was born in Townsville. He studied industrial design for several years at university but realised this career wasn’t for him and moved to Canberra where he completed a 1 year post graduate degree in computer animation. He then worked for three years at a video production company working on TVCs and corporate videos. Lachlan spent the next 12 years working full time in the computer games industry in Brisbane and doing part-time freelance work in his spare time. He worked as a 3D artist, Lead artist, Lead Animator, senior animator/concept artist and, most recently, senior concept designer during this time. Lachlan was involved in the formative teams of Auran Games, Evolutions Games and Pandemic Studios Australia. Lachlan has created animation, concepts and illustration for games on PC, Xbox, Playstation and next generation consoles. He has produced animation for TVC’s, theme parks and events, and created concepts and designs for launches, sculptures, events and displays. Natalie Jane Prior is the author of numerous books for children and young adults. Her work includes the classic picture book The Paw and its sequels (illustrated by Terry Denton), the internationally successful fantasy series Lily Quench, which has well over half a million copies in print, and which was broadcast on BBC Radio in 2006, and The Minivers, a four book series published by Penguin Australia and Scholastic UK. Natalie has collaborated many times with Sydney based illustrator, Cheryl Orsini, most recently on the picture book PomPom (Penguin, 2013) and story book The Fairy Dancers (ABC Books, 2015). Nick Earls writes long, short and medium-sized fiction, so far including thirteen novels and numerous shorter works. With the publication of the Word Hunters trilogy in 2012/13, he is now officially also a writer for children. He is the winner of a Children’s Book Council of Australia Book of the Year Award. 48 Shades of Brown was adapted into a feature film in Australia (Buena Vista/Prima). Five of his novels have been adapted into stage plays. He has also written for newspapers, including the New York Times, the Australian and the Sydney Morning Herald. Pamela Rushby was born in Queensland and has worked in advertising; as a pre-school teacher; and as a writer and producer of educational television, audio and multimedia. Her historical novels include When the Hipchicks Went to War (Hachette 2009), The Horses Didn’t Come Home (HarperCollins 2012), Flora’s War (Ford Street Publishing 2013), The Rat-catcher’s Daughter (HarperCollins 2014) and Sing a Rebel Song (Omnibus Books 2015). Samantha Wheeler lives in Brisbane with her family and many animals. Her first story took shape during a writing course at the Queensland Writers Centre in 2009 and was accepted into the inaugural Allen and Unwin Children’s Manuscript Development Program in 2010. She went on to have a short story published in the One Book Many Brisbanes anthology and to write Smooch & Rose, her first children’s novel, inspired by a local strawberry farm and her concern for Queensland’s koalas. Her second book, Spud & Charli is an action-packed adventure about horses, bats and getting carried away by your imagination while her most recent book Mr Cassowary is about, yes, you guessed it, a big bird and a big mystery. Can Flynn solve it? Tina Snerling is an illustrator, children’s wear designer and graphic artist. She lives in Brisbane with her husband, two kids and a wild imagination to draw the world with childhood innocence. You could say she is slightly obsessed with anything to do with kids! Her two cheeky little ones are a great inspiration in everything she draws! Tristan Bancks is a children’s and teen author with a background in acting and filmmaking. His books include the My Life series, Mac Slater Coolhunter (Australia and US) and Two Wolves, a crime-mystery novel for middle-graders. Two Wolves won Honour Book in the 2015 Children’s Book Council of Australia Book of the Year Awards and was shortlisted for the Prime Minister’s Literary Awards. It also won the YABBA and KOALA Children’s Choice Awards. It was released in the US as On the Run in November 2015 (Farrar Straus Giroux). Yvonne coordinates Write Links, the Brisbane children’s writers and illustrators group and is vice president of Book Links QLD (Inc.) she reviews for Buzz Words Magazine and occasionally for the CBCA QLD newsletter. Want to know who to meet on the Sunshine Coast event on Friday 26 February? Look at the Voices on the Coast list of authors and illustrators. http://www.voicesonthecoast.com.au/sunshine-coast-authors—illustrators.html to see information about Chris Collin, Aleesah Darlison, Pat Flynn and Judy Paulson. 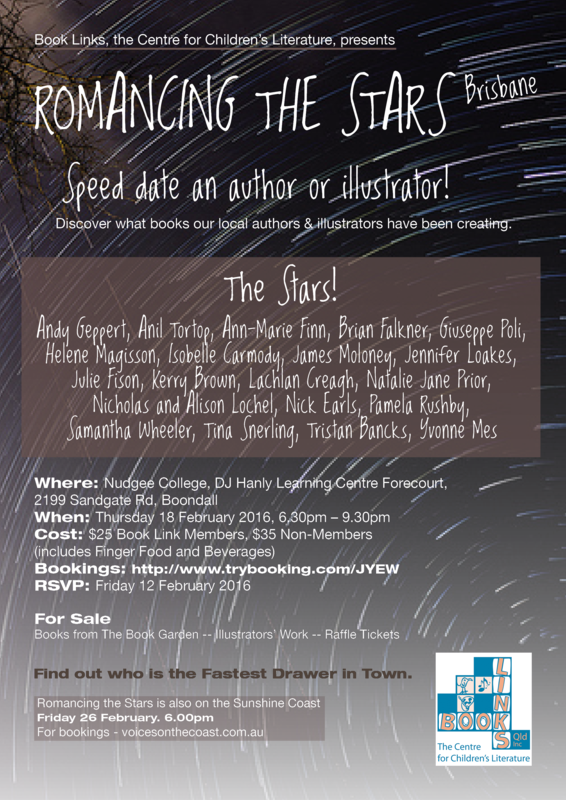 Two Romancing the Stars Events in 2016! We are uber pleased to announce that we will be having two Romancing the Stars Events in 2016. The first event will be held in Brisbane on Thursday, 18th February. 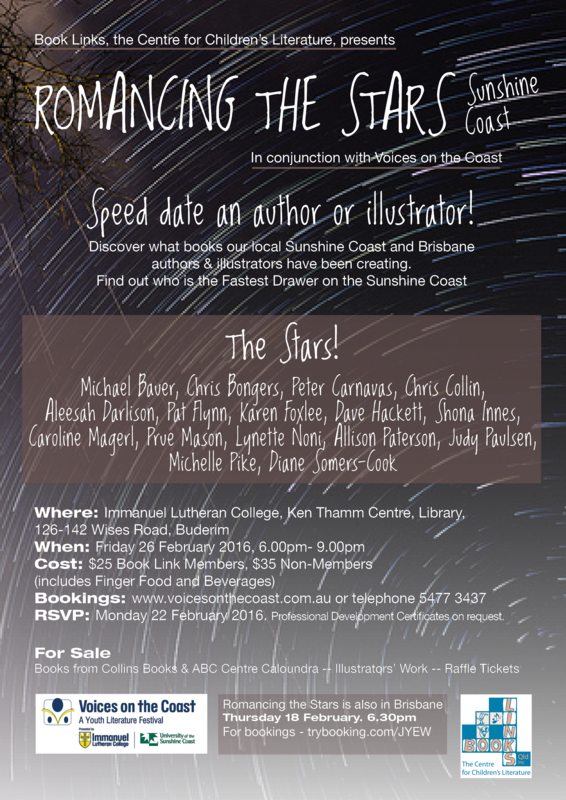 And a second event will be held on the Sunshine Coast on Friday, 26th February. Watch this space for all the details!